I remember my mom making "mud pie" when we were little: paper cupcake cups full of chocolate pudding topped with ground up oreos, green coconut shreds and a gummi worm to complete the effect. 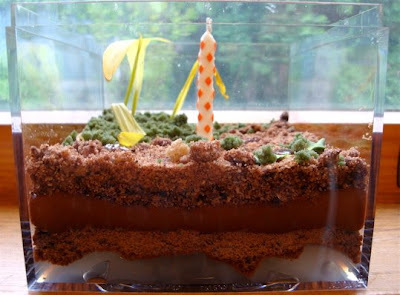 Check out this terrarium cake at Gather and Nest! Too fun- and definitely a mud pie taken to all new heights. Gives a new meaning to edible gardening. Nice blog that.